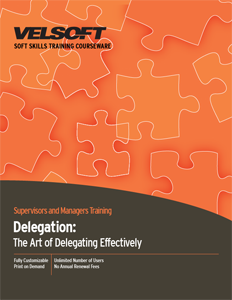 Delegation Training Material is designed for trainers to teach supervisors and managers the art of delegating effectively. Teach your management team how to define delegation, how to pick the right people, how to give instructions, monitor progress and more! Seeing is Believing This sample manual to teach Delegation: The Art of Delegating Effectively is in MS Word format. Delegation can be a tough topic to master, but we've developed customizable training materials to help! This comprehensive one-day course includes information on what delegation is, who to delegate to, and how to ensure top-notch results. Students will also get plenty of hands-on practice with their new delegation skills. These interactive training materials include a pre-assignment, detailed instructor guide, student guide, pre and post assessments, quick reference guide and more. Plus, for students who like to learn from their mobile devices, ask about opportunities for blended learning.